At dawn, the leaders of the defense gazed out west from the walls of Constantinople. 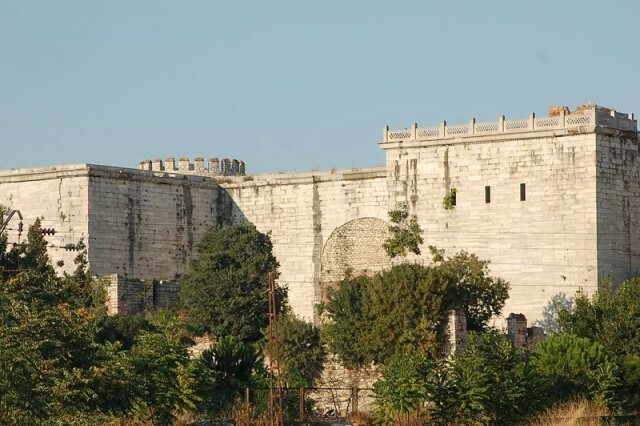 The two Byzantine commanders, Bonus and Sergius, did not speak as they took in the scale of the besieging army. It was huge, eighty thousand strong at the least. Everywhere there could be seen siege engines, towers and machines for throwing shot, great mangonels and smaller catapults, covered battering rams and countless wooden ladders. This was the army of the Avars, long-standing enemies of the Byzantine Empire. They had come at last to take the great city which still called itself the capital of the Eastern Roman Empire, but they were a people who fought from horseback. They were mobile, lightly armored and swift, and they were unused to siege warfare. To storm the walls of Constantinople they would need allies in war. These they found in Byzantium’s other old enemy, the Persian Sassanid Empire. The Byzantine soldiers were heavily armored and highly trained, with keen spears, long shields, and coats of gleaming flexible armor which reached down past their knees. They fought with discipline and order against the waves of attackers, and they fought with the determination of those who have nowhere to retreat to if their line fails. Again and again, the hoards of the Avar broke on the great walls of Constantinople like waves on a high sea cliff. The Persians were crossing on many barges and little boats, in great numbers, and the Byzantine ships sped to meet them in mid-crossing. Huge clouds of fire arrows sped through the air. The barges, rafts, and floats were rammed, surrounded, burned and sunk by the Byzantine galleys. It did not take long for the wide Bosphorus to become choked with debris and burning wreckage as hundreds of ships fought to the death. A modern photo of the Golden Gate. Then the news arrived on both sides. The Persians had been foiled in their attempt to cross. 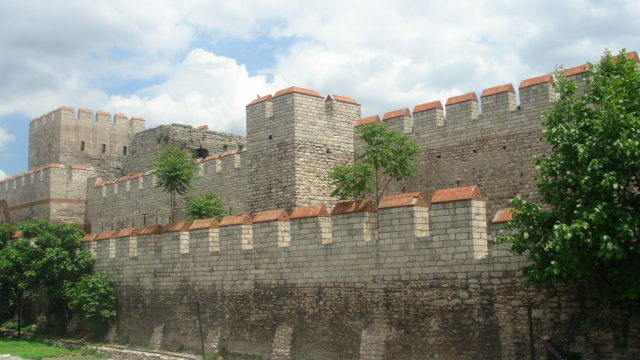 There would be no assault on the eastern wall of the city. The attackers were distraught, but the defenders burst into fierce and joyful singing. All at once, as if by unspoken agreement, the crowd at the gate began to withdraw, then to flee. Their siege engines, towers, rams, and catapults, were burning. 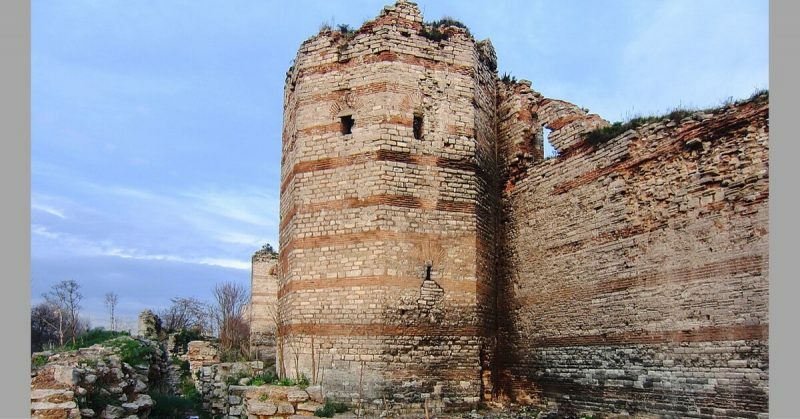 The Avar dead carpeted the ground before the Golden Gate of Constantinople. 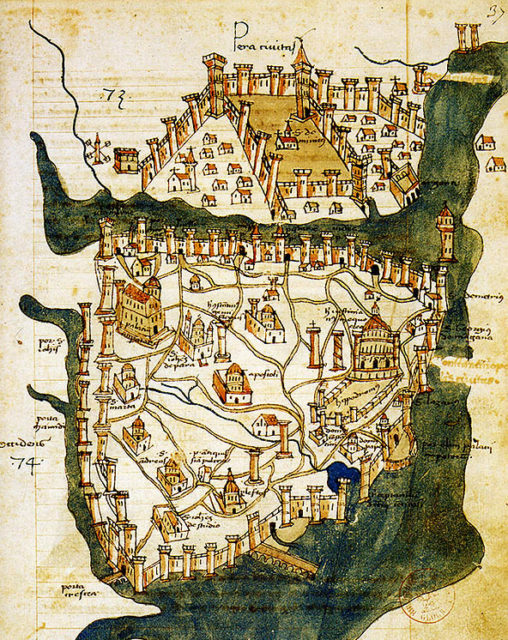 The siege was broken, and the Avars never again threatened the great capital city of Byzantium.